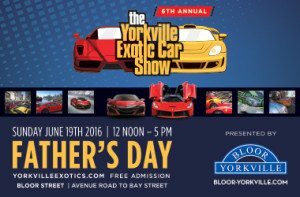 The Bloor-Yorkville BIA is thrilled to present the 6th Annual Yorkville Exotic Car Show on Father’s Day, Sunday, June 19, 2016 between Noon – 5 pm. 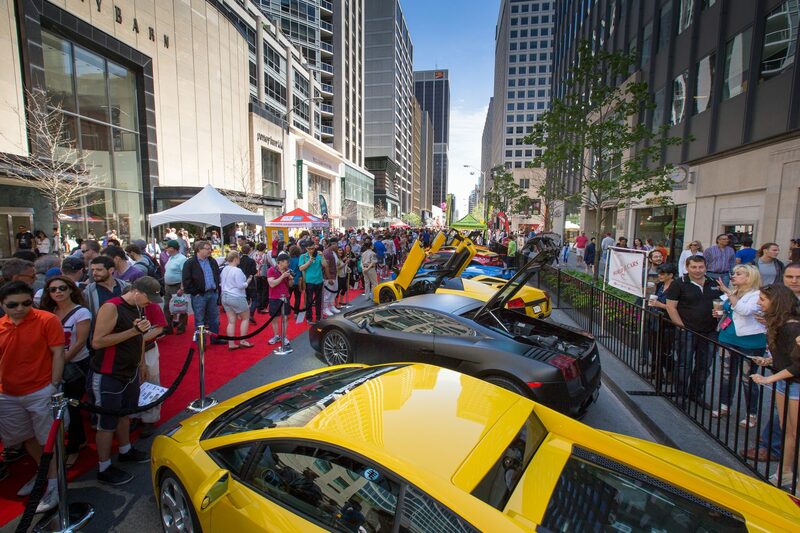 Bloor Street, will play host to an impressive red-carpet display of 110 highly coveted vehicles from Porsche, Ferrari, Lamborghini, among others, all in support of Prostate Cancer Canada (PCC). Our neighbourhood is home to some of the finest retail shops in the world and provides a unique and prestigious backdrop for this hugely popular car show which draws over 80,000 visitors each year. A total of 11 Car Corrals will be on display. Featured exotic cars include the newest and extremely rare Ferrari, La Ferrari, valued ín excess of $2 Million and the new 2017 Acura NSX. In 2014, we raised over $40,000 for Prostate Cancer Canada, and we hope to do even better this year. We are honoured to be associated with an incredible group of annual corporate sponsors and to also welcome a few new ones. Confirmed are Acura Canada (Platinum); Yorkville Village, Manulife Centre and Lexus On The Park (Gold); Auto Strada Magazine, Nespresso Boutique Bar, Import Fest and Somerville Auto (Silver). Help us fundraise, for Prostate Cancer Canada, by sponsoring a car, as a Bronze Sponsor (20 available – $500), by going to the event’s website, http://yorkvilleexotics.com/sponsor-a-car-in-support-of-prostate-cancer-canada/. Choose a car from 110 display vehicles and receive a linkable logo on the event’s official website, beside the photograph of the sponsored vehicle for one year. In addition, the sponsor’s name (text only) will be printed on a windshield banner for the car during the event and you will receive two Paddock Club Passes. With 11 Car Corrals, we also have Car Corral Sponsorships available for $1,500. Car Corral sponsorships include a linkable logo on the footer of the event’s official website, (2) 4’ x 2’ four colour, eye level banners located at the rear of the corral. Your company name/logo will be listed in the ‘Car Corral Sponsors’ section on top of the ‘Cars in the Show’ page on the event website for one year and you will receive four Paddock Club Passes. Visitors will be able to make donations to Prostate Cancer Canada on-site, at the PCC & Bloor-Yorkville BIA tents. For those who will be coming to the area, please be reminded that Bloor Street will be closed to traffic between Avenue Road and Bay Street on June 19 from 6 am to 8 pm. The event will be open to the public free of charge, from 12 noon to 5 pm. Parking garages, located throughout the area, will provide ample parking and the TTC has excellent service to the area.